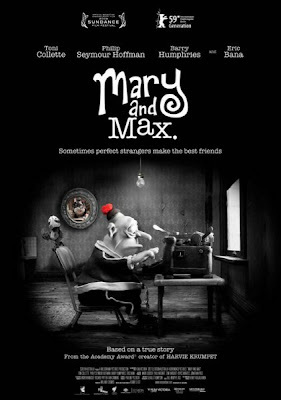 I wasn't entirely planning on watching Mary and Max (2009), but it was just there so I decided I would give it a go. Yes, the poster does look a bit grim, but it's a cartoon, yes? For kids? No. Unhappy with her friend-less life, an eight year old Mary (later voiced by Toni Colette), who lives in Australia, decides to adopt a pen friend from America. She picks at random Max (Phillip Seymour Hoffman), a lonely man living in a dingy apartment in New York. They write to each other often, and become good friends, but as Mary grows older she aspires to treat Max's condition-Asperger's syndrome-which causes some trouble for their friendship. Now I just want to get one thing clear...by NO MEANS show this to a kid under the age of 12 years old (or a kid who hasn't had 'the talk' yet). This is one of those animated features for the older crowd, so for the young ones opt for a movie like Cloudy with a Chance of Meatballs. I can't say this was perfect, but it was actually quite thought provoking. And heart breaking. I honestly don't know what else to say about this film, but only that it is a must see for fans of the animated-for-adults genre. It's witty and unique, something we rarely see these days. And that's all I have to say about that. It's fantastic! Mary and Max definitely does have one of the best portrayals of Asperger's I've seen. Adam also had a really good portrayal, as Hugh Dancy was so surprisingly good with his role. And I agree with you, PSH's work in this was really great.